Most Europeans support the idea of a “basic income” paid to every individual to cover their basic needs, according to the first EU-wide survey on the subject. Governments would pay the same amount of money to each person, regardless of whether they work. The poll, conducted by German company Dalia Research in April, was the first EU-wide survey to address the proposal of a basic income, defined in the poll as “an income unconditionally paid by the government to every individual regardless of whether they work and irrespective of any other sources of income”. The preliminary results found that about 58 percent of respondents were aware of the idea of a basic income, and 64 percent would vote in favor of the policy in a referendum. 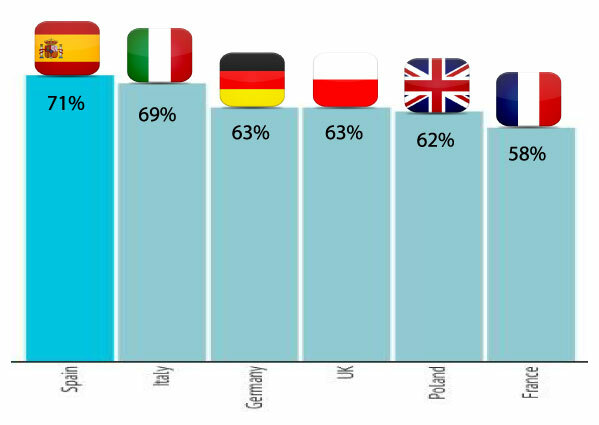 Residents in Spain and Italy were most in favor of a basic income, with 71 percent and 69 percent saying they would vote for it, respectively. In addition to stating whether they would vote for a basic income, participants were also asked about their biggest hopes and fears if the model was introduced. Most of those in favor of the proposal – 40 percent – said it would “reduce anxiety about basic financing needs,” while 31 percent said it would “improve equal opportunity”. Meanwhile, the most popular fear – expressed by 43 percent of respondents – was that basic income would encourage people to stop working. However, the survey indicated that this would not actually be the case, with around 34 percent of respondents saying that a basic income “would not affect my work choices”. Specifically, only 4 percent of participants saying they would stop working if they had a basic income, and just 7 percent said they would reduce their working hours. Several European countries have already begun working toward offering a basic income for their residents.